We've been looking at performance consistency since the Intel SSD DC S3700 review in late 2012 and it has become one of the cornerstones of our SSD reviews. Back in the days many SSD vendors were only focusing on high peak performance, which unfortunately came at the cost of sustained performance. In other words, the drives would push high IOPS in certain synthetic scenarios to provide nice marketing numbers, but as soon as you pushed the drive for more than a few minutes you could easily run into hiccups caused by poor performance consistency. 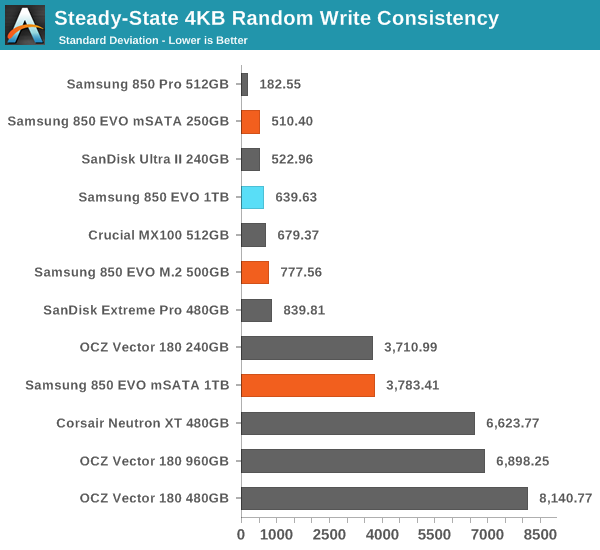 Once we started exploring IO consistency, nearly all SSD manufacturers made a move to improve consistency and for the 2015 suite, I haven't made any significant changes to the methodology we use to test IO consistency. The biggest change is the move from VDBench to Iometer 1.1.0 as the benchmarking software and I've also extended the test from 2000 seconds to a full hour to ensure that all drives hit steady-state during the test. For better readability, I now provide bar graphs with the first one being an average IOPS of the last 400 seconds and the second graph displaying the standard deviation during the same period. Average IOPS provides a quick look into overall performance, but it can easily hide bad consistency, so looking at standard deviation is necessary for a complete look into consistency. I'm still providing the same scatter graphs too, of course. However, I decided to dump the logarithmic graphs and go linear-only since logarithmic graphs aren't as accurate and can be hard to interpret for those who aren't familiar with them. I provide two graphs: one that includes the whole duration of the test and another that focuses on the last 400 seconds of the test to get a better scope into steady-state performance. 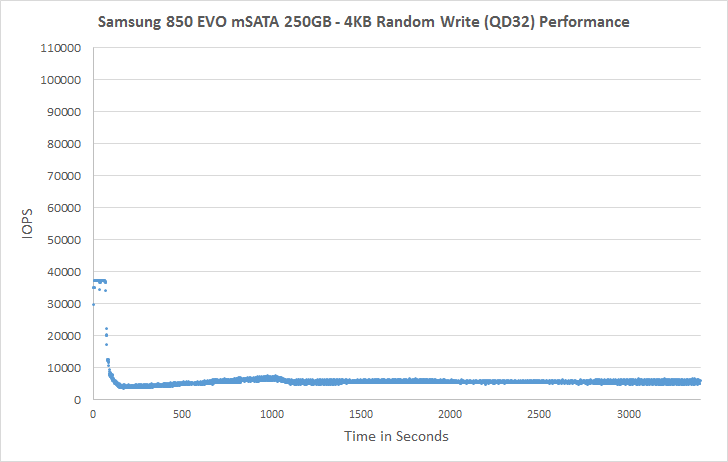 For a mainstream drive, the 850 EVO mSATA/M.2 does relatively well in IO consistency except for the highest capacity 1TB model. Strangely enough the 2.5" 1TB 850 EVO does just fine, so this issue seems to be limited to the mSATA version. 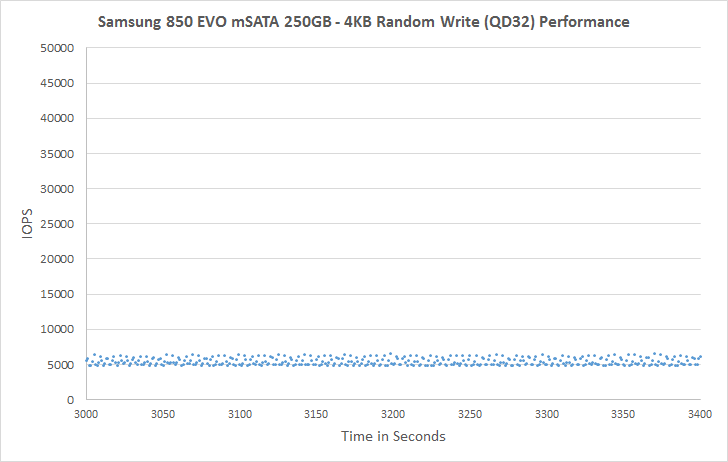 Looking at the standard deviation reveals why: the IO consistency of the 850 EVO mSATA 1TB, even with overprovisioning, is horrible compared to the rest of the 850 EVO lineup. The issue with the 1TB mSATA is actually worse than I expected because it's literally stopping for seconds in a frequent manner. The pauses can even be over 50 seconds, so this isn't just some normal garbage collection that's happening in the background. I find this to be very alarming because it may have dramatic impact to user experience and it's simply something that no modern SSD should do anymore. I did let Samsung know about my findings before publishing this review, but I wasn't really able to get any comment from them regarding this issue and whether Samsung has noticed something similar in its internal tests. Adding over-provisioning seems to help as the pauses become much more infrequent, but for now I would still advise against buying the 1TB mSATA version until there's a fix for the IO consistency. As for the other capacities, the 850 EVO has excellent consistency and steady-state performance for a mainstream drive. 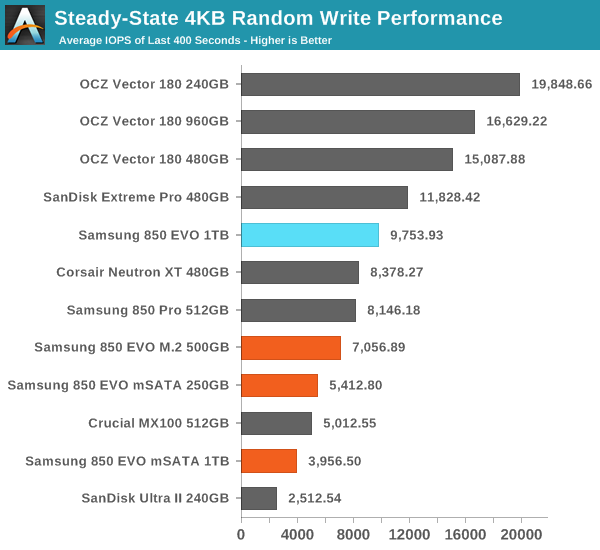 The capacity has some effect on performance, but even the 250GB model has roughly twice the performance of 240GB Ultra II thanks to faster V-NAND.